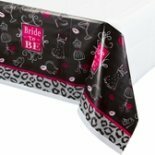 The bridal shower gift table is an area where your guests' will place their presents upon entering the party. Consider this part of the entire room when planning your decor. Even if it's not in full view, it will usually be seen by all attending when the guest-of-honor opens her surprises. Often, the hostess or other helper will greet those invited as they enter. Then, either this person or the guest, will take their gift to the designated spot. Typically, the bridal shower gift table is used to display the gifts after they are open. A large number of guests may require either using more than one table, and/or a bigger space. • Place it in a convenient location...not in the main flow of traffic, but easy enough to be seen. • Coordinate the bridal shower gift table with the rest of your decorations. This automatically helps bring the look together. • Make sure it's sturdy. Some items may be heavy. • Have an area big enough to handle packages for the amount of guests invited. It's okay to have large items on the floor, but have room for smaller packages. • Cover it with a cloth. This can be material or paper, preferably something that complements your colors and/or theme. • It is usually best to keep the top empty, until guests arrive. If you want to decorate it, trim around the sides. Silk swags, and tulle are some suggestions. • If you don't like the idea of a solid color top, use a patterned cloth. • Hanging balloons or a banner, above or behind it, may also help dress up the area. • Keep at least two chairs nearby, one for the bride as she opens the presents, and one for her helper. • Think of the bridal shower gift table space as being a part of the overall look you are trying to achieve. Include it in your original decorating plans. • Keep a pair of scissors handy, for a ribbon that may need to be cut while opening a package. • A trash bag/bags can be hidden under the table, for easy access when it comes time to open the gifts. • Have a pen and paper ready for the hostess or whoever will record the gifts given. • Go from the gift table page, back to Bridal Shower Ideas For You homepage.